Sign up to our mailing list to hear about upcoming events, what is happening in the vineyard and offers. When and where: Thursday 19th January, 2017, 8pm Drinks & Canapes for 8.30pm Play Reading @ Tonic House – 386 Flinders Lane, Melbourne. Atika are the proud sponsor of the Personality of Good Food events at Bella Vedere. This is a collaborative project by Damien Pleming and Bella Vedere designed to celebrate the people behind Bella Vederes raw ingredients. When and where: it begins on January 31st 2014 with a celebration from 5 – 7pm, you are welcome to book a table for dinner after the celebrations. When and where: Wednesday 29th January from 5.30 – 7.30pm. If you are in the area come down for a drink. Join us for a night of varying flavours, textures and scents as we work our way from savoury to sweet with three exceptional wines and six decadent courses. More Information. Atika is proud to be a part of the ‘Nostalgia’ dinner at Bella Vedere in Coldstream. 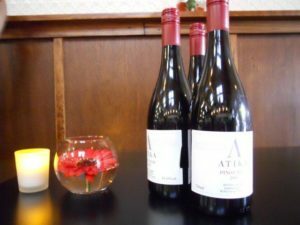 Atika Wine will be an accompaniment to one of the courses. More information.